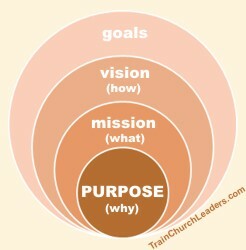 To suggest that vision expresses our purpose means we must first identify our purpose. Mission, vision, and goals must all stem back to and grow out of our purpose. Hence, our purpose answers why we do what we do, providing the essence of who we are. Our mission explains what we will do to live out our purpose. It’s not enough to merely know what our purpose is and what we should do to accomplish it. We need to do it. Remember that “faith by itself, if it is not accompanied by action, is dead” (James 2:17). This is where vision and goals come in — the outward expression of our purpose. What will it look like to get there? How will we do it? How will we know if we get there? Leaders, guard against getting so caught up in terminology that it becomes confusing. Defining and distinguishing the words – purpose, mission, vision, goals – must not be the primary objective. What’s most important is that we know . . . If we can’t figure out the “why” then we might want to question if we should be doing it. and “how” we will do it in ways that line up with the “why”. If we do “what” we should be doing in ways that contradict or fail to align with our purpose (the “why”), then we gain little or nothing. Think of love as our church purpose. God’s Word reminds us that if we do a lot of good “but do not have love” we are “only a resounding gong or a clanging cymbal.” We are “nothing” and we “gain nothing” (1 Cor. 13:1-3). Next → Next post: Have a Vision That Clarifies Your Purpose?